NEW: Changed New Work and ReAcquire ‘Purchased’ option label to ’Owned’ and the Works Financial tab to ‘Source’ instead of ‘Purchased From’ for Owned Works. 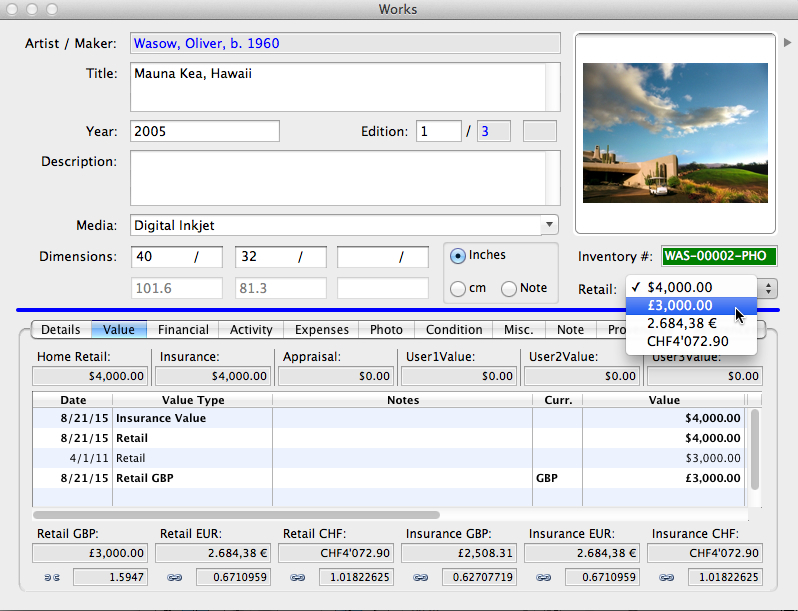 NEW: Added ability to link to a URL typed into the Works Photo tab Location column with use of the “?” lookup button. NEW: Added ability to assign obsolete currencies such as French Franc, German Mark, Belgian Franc, Dutch Gilder and Italian Lira not available in Mac and Windows operating systems to Works, Editions and Transactions. NEW: ‘Active’ check column to the Edit Related Lists > Currency list to limit the selections in all Currency drop-downs to only those Currency codes designated as Active. All existing currencies in the Currency List will be automatically marked as Active upon database upgrade except obsolete currencies (#1 above). The user can then choose to add or remove active currencies from Edit Related Lists > Currency list. NEW: Added ‘attach document’ button to the Open Document window for all modules providing the manual attachment of multiple files with a single dialog. Corrected the the temporary inability to Refresh Currency Rates from the web and changed rates to be up to the minute through XE.com. NEW: Added a prompt to warn users of “items of mixed currency” on Transaction and Transaction Detail reports with Non-home and Alt. Currency Tracking options disabled. Revised 23 standard Reports for spacing issues. NEW: Created new Works report for Artist List providing an itemized list of Artists contained in any set of Works displayed in the spreadsheet. NEW: Added Category selections to the References module Exhibition type and formats without browsing, and also for easily accessing these files when required in other tasks. NEW: Implemented a new “Execute Search” button on all Contact and Artist key-press searches on Windows OS, for example when adding a New Work or Transaction, to facilitate searching with right-to-left text locales such as Hebrew and Arabic if enabled in the Windows OS regional settings. NEW: Added additional “Alternate Currency” Transaction total columns to the ‘Complete’ Transaction spreadsheet layout. Revised and improved line and spacing issues with 12 standard reports. NEW: Implemented feature to organize Documents and other files added to the Documents folder associated with individual Works into distinct work subfolders within a folder designated for the Artist Contact record. This allows for directly adding associated files to the emailing of works without browsing, and also for easily accessing these files when required in other tasks. NEW: Added new App Preference to disable the ‘auto-complete’ of Work and Edition Titles when typed. When upgrading a database to 3.0.32, the option is checked by default to retain the original functionality, but can be unchecked to Disable. NEW: Added the ability to print multiple copies of labels with the addition of a ‘Number of Copies’ entry field on the Run Report window for labels only. NEW: Added the “Shipment” Reference Number to the Transactions Complete layout to allow for Searching. It is simply titled ‘Reference Number’. NEW: Added the ability to Search by the Work’s Current Owner Credit Line on the Provenance tab, as well as the Credit Line in the Works Provenance detail line-items. Implemented ability to configure Send Email settings for ‘Secure’ Email providers such as Google/Gmail. Implemented the ability to attach email (.eml) files to a Contact’s Document list when Sending an Email in a Contact or Transaction detail window, as well as the ability to open the attached email document in Outlook on Windows OS. Implemented the ability to ‘Select Marked Contacts’ when choosing the To:, CC: or BCC: email address selection when Sending an Email. Implemented Image ‘Attach’, ‘Remove’ and ‘Rotate’ (90, 180 and 270 degrees) functionality from menu. Implemented in ViewSets the ability to use the Advanced section to query text within Categories ‘Anywhere’, ‘Begins With’ or ‘Ends With’. Added a new App Preference option for “Enable ‘Add to List’ prompt in Detail windows” to turn On/Off the automatic Add to Related lists on the fly in Detail combo lists. Enabled the editing of the document Description column in the Open Document window. Added the ‘Institution’ to the list of available fields for Searching Contact when adding a New Transaction, in addition to ‘Sort Name’ and ‘Last Name’. Implemented the ability to enter dates in the native “region and language” setting format when choosing an Advanced Date field in View Sets. Changed the conversion from CM to Inches to be based on eigths as fraction denominator instead of sixteenths in Works and Editions. Over 200 fixes and enhancements for stability and security. This update includes major speed improvements and enhancements to multiple-currency functionality requested by international galleries, among other things. See a Work Detail screen capture and walk-through video demo of these features for illustration. Alternate Currency Value Tracking. Link and view up to six (6) alternate (foreign) currencies based on conversion rates updated from the Internet or rates defined by user. Updates to current rates refresh all Alternate linked amounts. Links may be set or unlinked at any time — when entering new work, reviewing a work record, or making a transaction. Currency Fixed Values. On a work-by-work basis, user may fix alternate currencies to non-conversion rates, i.e. ; a retail value may be set for each currency market as $10,000 or £8,000 or 7,500€ regardless of their true conversion relationship to each other. Fixed alternate values automatically populate offers and invoices made in that currency. Enhanced Alternate “non-home” Currency. Existing alternate “non-home” functionality now integrates with ‘Alternate Currency Value Tracking’, i.e., if work value is set as a fixed currency other than the base currency for the gallery, the linked alternate values as well as alternate currencies entered for transactions adjust to display conversion to the work’s base currency instead of the gallery’s home currency. Drop-down Retail Selection. User can switch between alternate currencies with a click and print price lists with mixed currencies. Enabling “Alternate Currency Value” displays all alternate values in Work record value section. Option to “Link All” alternate currencies when entering new work. Alternate Currency Values added to Spreadsheet view for reports. See Pro screen capture displaying first three features listed below. For more details, please contact Support. Added an NFS (Not for Sale) check-box to Work records, designated by the color Orange. NFS Works cannot be Sold and this notation supercedes the Yellow color of any Works also ‘Out on Consignment’, ‘Loan’, etc. Added an ‘All Records’ selection at the top of each left-panel module list (i.e. All Works) to eliminate the need and time required to display all records of a specific module in the spreadsheet each time the module is selected. Added ‘Find’ button and EditFind menu item for a new Find dialog box to find First, Next or All matching records from a Detail form or the Main spreadsheet view (as in GalleryPro, click the binoculars). This works great and is very powerful when used in concert with the Search toolbar in the main header. Added ‘Print Image’ functionality from the Primary ‘Image form’ Detail (dbl-click on the Image on Works or Editions Detail) creating a Word document containing only the Image. Landscape or portrait orientation of the document is automatically set based on the image proportions. Implemented drag-drop of Excel files into the Open Document form, and subsequent opening in Excel. Added Financial Accounts drop-downs to the Editions form (like GalleryPro) on a new ‘Financials’ tab if Accounts Enabled. These Account values will be copied to any Works added from an Edition. Added the additional ‘Address Description’ column to the Contact, Shipper and Ship Destination grids in New Transaction View Set. Added ‘Edition Quantity’-based calculations for Edition Financials report, as was available in GalleryPro.. Restored the ability to include concatenated Works Provenance, Exhibition, and Bibliography entries on Transaction Documents automatically. Added the ability to ‘Mark all contained Works’ when viewing a Transaction Detail, which will mark the Works listed on the Transaction. Implemented changes to allow exporting accounting data to QuickBooks Pro for Mac. Added a Preferences option to ‘Display Spreadsheet search results Immediately’ to enable/disable the v3.0.24 searching feature on Main grid. Added the Works ‘Original Net’, ‘Original Cost’, ‘Calculated Net’ and ‘Due to Consignor’ to the Main grid Complete layout and Works Export list. Added ‘Image path’ to the Editions Export list. Many additional fixes and other program refinements. For more details, please contact Support. Alternate Work-based Currency is now available for Owned and Co-Owned Works as well as Consigned works. This feature allows accounting for a work in its own designated base currency throughout its history as may be required, rather than converting to a user’s home currency — bypassing the vagaries of currency fluctuation. Implemented Artsystems CloudSync data synchronization on Windows OS as well as Macintosh. Additional major performance improvements, specifically in record loading, navigation, searching, sorting, and scrolling. Implemented QuickBooks Pro/Premier .iif export file functionality. Implemented emailing to selected group of Contacts directly from Pro. Additional fixes and program refinements. Implemented VAT entry fields and accounting calculations in Transactions, Works, Contacts and Edit Related Lists with selection of ‘VAT’ in App Preferences Transactions module. Includes new Invoice, Cash Sale, Offer and Credit Memo document templates for Standard and Margin schemes. Implemented generic Accounting export functionality on Financial Reports form and inclusion of Chart of Account entry dropdowns on Works, Transactions and Edit Related Lists with selection of ‘Show Accounts’ in App Preferences Transactions module. Added ‘Sales/Cost of Sales’, ‘Top Sales’, and ‘Sales Tax’ Financial reports, including a variation of ‘Sales/Cost of Sales VAT’ to include columns & totals for VAT when enabled. Fixed display issue for Work Information tab where User-defined Auxiliary data fields were not displaying if there was also text for Work Description field. Fixed issue with Dimension Notes display. New ability to change works display order on the fly within Artist records (sort by Title, Inventory Number, or Year). New expanded Dimensions display can include Auxiliary Dimensions field. New: Auxiliary Dimensions and Dimension Notes now included in Work captions in emails. Note: if after updating, the main feature images for Exhibitions and/or Selections are not displaying, please tap ‘Reset’ in the ProFile settings (the gear icon in the upper right) to download all data/images. 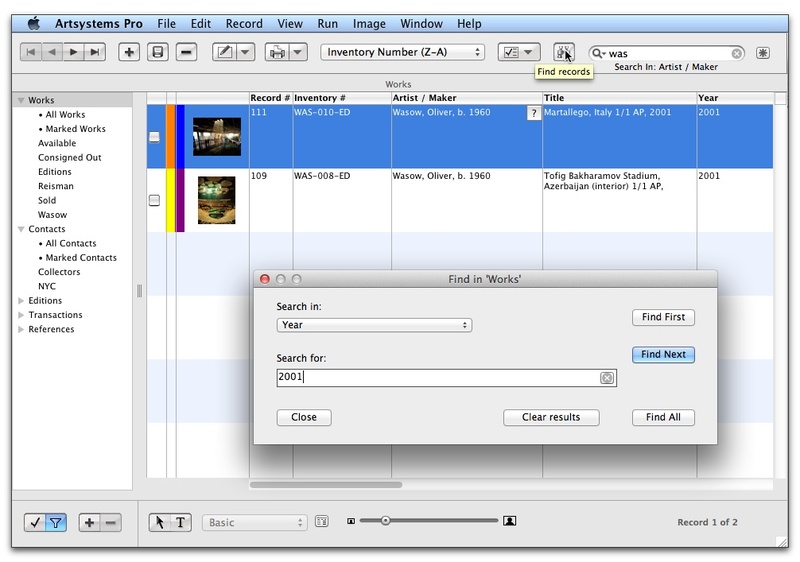 Keyword and Advanced Search: Instantly locate individual records or filter lists of records based on keywords or combinations of field-based parameters such as: Artist, Title, Year, Media, Inventory Number, Type, Categories, Location, Source, and any of the 12 user-assigned Auxiliary Fields. See 1.7 below for instructions regarding updating from versions earlier than 1.7. Note: Please contact Artsystems Support before updating to this version. Due to database structural changes, you must delete/reinstall the app and re-download the app data via WiFi to the Internet. Please confirm security key with Artsystems Support before updating. Work thumbnail image now displays in Document View. New arrow navigation control for navigating large record counts.